Review: When I first heard about this game, I was excited. It sounded like a game of Cowboys and Indians, but with aliens instead of Indians. So I waited in anxious anticipation for the game to come out. Imagine my surprise when I learned the game was just vaporware. It was quite a shock to my high school mind, but I eventually got over it. Years later, the game resurfaces, and this time, it's an actual game and not just a bunch of development shots. I was even more surprised than before. I can't wait to try it, I thought to myself. But then, I did try it, and things just went downhill. 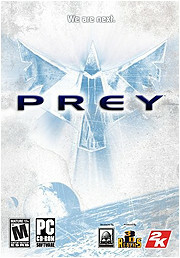 For the uninitiated, Prey is a FPS that was developed by 3D Realms a long time ago, then dropped, and then picked up again. The basic premise is that you're Tommy, a Native American guy who, along with his grandfather, girlfriend, and a hundred or so other people, have been teleported aboard an alien spaceship for some nefarious person. The odds seem to be stacked against young Tommy, but luckily, Tommy can use alien armaments with ease, plus he has the help of his dead ancestors and their magic crow to lead him onward. The game starts out strong. The entire opening sequence with the entire bar being transported into the ship, along with the the great visuals inside the ship. When you finally regain control of Tommy, you travel through the ship, doing battle with your hideous alien captors while walking up special walkways along the walls and ceilings, and even walking through portals like those you'd see in the recently released Portal game. It's all very impressive, so much so that it takes your mind off the underpowered, generic weapons you have to choose from at the onset. You're bound to find better stuff the deeper you go. Hours later, you've gone through several different levels, found yourself a few new weapons, and have seen the same "walkway up the wall" trick over a dozen times. You realize that all the weapons you've picked up are just the usual fare for an FPS (machine gun, shotgun, grenade launcher, rocket launcher, mines, etc), but at the same time, you're starting to wonder why it seems you have to pump so much alien ammo into your foes before they go down. Of course, it doesn't really matter that much to you, thanks to one special power that Tommy has: he can't die. That's right, Tommy can't die. If his health is reduced to nil, he wakes up on some donut-shaped island made to look like the American Southwest, and he must kill red and blue wraiths in order to refill his health and spirit meter. Well, that's partially true; you don't NEED to kill them to refill your meter, as you get half of your health back as soon as you jump into the hole at the center of the donut island, but you can get extra health by killing wraiths. Of course, even if you just go back with half your health and die soon after, you'll just be put back on the island to shoot at more wraiths. Rinse, repeat. And that's the whole game. The developers try to spice it up a little but including short segments where you pilot a little spaceship inside the larger spaceship, but the bottom line is that even if you play like a total moron, you'll still get through the game. Even if you die almost immediately after you come back to life, you'll still be able to outlast them as long as you can make at least one shot while you're alive. Think about it: every single FPS that's been made has relied on death as the main punishment for sloppy playing, and this game does away with it. Imagine if you were to play Rainbow Six, and instead of a teammate being removed from play after he's killed, he simply disappears for a moment, and then pops back to life at the very spot he was just killed. There would be no challenge to the game, and that's what you have with Prey: a game with no challenge. Actually, let me revise that a little: the challenge in Prey is to complete the game before the lack of real difficulty bores you to tears. Needless to say, I failed to unlock that particular Xbox Achievement. I wish there was more to it, but this game is really just a chore. The weapons are weak and uninspired, the story is uninteresting, the AI is brainless, and the gameplay itself is a joke. The one thing the game really has going for it is the graphics, but only used that hook sparingly. I mentioned the portals earlier, and they looked really cool at the time, but the game only showed them off at the beginning, and then a little toward the end. The only thing of note I can think of in the game is that some of the enemies will leave the scene by escaping into what look like giant ladyparts that seem to have some kind of horrible infection about them. I think that's why this game got an "M" rating. I personally like Prey. Sure, it´s no 90% Game, but it´s pretty entertaining, plus, it can´t frustrate you since you can´t die. A nice game for the 15 or 10 bucks it costs right now. Just don´t give a damn about the obviously unfinished and hurried storyline in the game. This game's plot was crazy...but somehow worked in the game. I played this game for a while, and I found it frustrating to leave my body for so long, and so often. The targeting system was a bit glitchy on my computer, but I managed to work around that. The not being able to die thing really got on my nerves, mainly because it is never explained, but mostly because it ruins the game's feel for urgency. The aliens are really tough and you need to be good to kill them, not invincible. Had they put in a feature that made you have to kill a certain number of wraiths, or complete a puzzle, to restart outside your body at the beginning of the level. And have spiritual enemies that attack you, until you returned to your body. And if you died here, you'd have to restart the level. That would have improved the game a bit, maybe not perfect, but better than the current ordeal. It had a good plot idea. It was pretty retarded how you couldn't die, though. But it did introduce me to Coast to Coast AM. My main problem with it was the lag and the achievements. I got it for the 360 and after i finished the game, i went on to take on the multiplayer, and thats when the headaches started. trying to find a game was terrible, the lag was stupid, and the achievements were so stupid to get, you would end up with a great big bushy beard when u finaly got them. when will companys learn that achievements are supposed to be fun, not work! I haven't played it, but I heard towards the end of the game some ghost tells you to go to some temple of trials, then when you actually get there that ghost says "Nevermind, go back and fight the aliens." I disliked Prey. It just seemed to throw me for a loop after I bought it from the bargain bin. A game with good graphics, but plays like a fps from 10 years ago? I just couldn't comprehend it. Believe it or not, Prey had the Portals before the game "Portal". Duke Nukem 3D is the epitome of all 3D Realms games, in my opinion. You should do a bit on that, and Shadow Warrior! There is another game, similar to Duke and SW as well, called Blood that you also should try if you can get your hands on it. I do believe it, 'cause I wrote it!